ARA completely rebuilt the site including grading, concrete and asphalt. 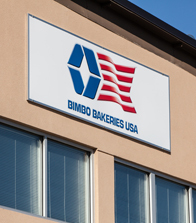 Bimbo needed a larger shipping facility in a central location, rather than having several facilities in smaller locations. Large sites are rare in Queens and surrounding areas, so Bimbo acquired a site that required massive modifications and upgrades to suit their operations. ARA converted a massive 80,000 square-foot distribution facility from a rundown shipping hub to the specialized facility it is today. All dock edges where rebuilt along with 90 transit door openings. The existing grades were changed to accommodate specialized bread delivery trucks. ARA completely rebuilt the site including grading, concrete and asphalt. The building was completely gutted, receiving all-new mechanical systems and finishes. The work involved several structural transformations, making this one of our more challenging build-to-suit projects. ARA worked closely with architects, landlord and the BBU Group to complete a challenging project within the allotted timeframe.